What are “communities of practice”? In their 1991 publication Lave and Wenger discussed situated learning and created the concept of communities of practice. Their interpretation of learning was that we all learn “on-the-job” or at least in the specific context we operate within. The diagram demonstrates how there is a core and periphery or fringes of practice. 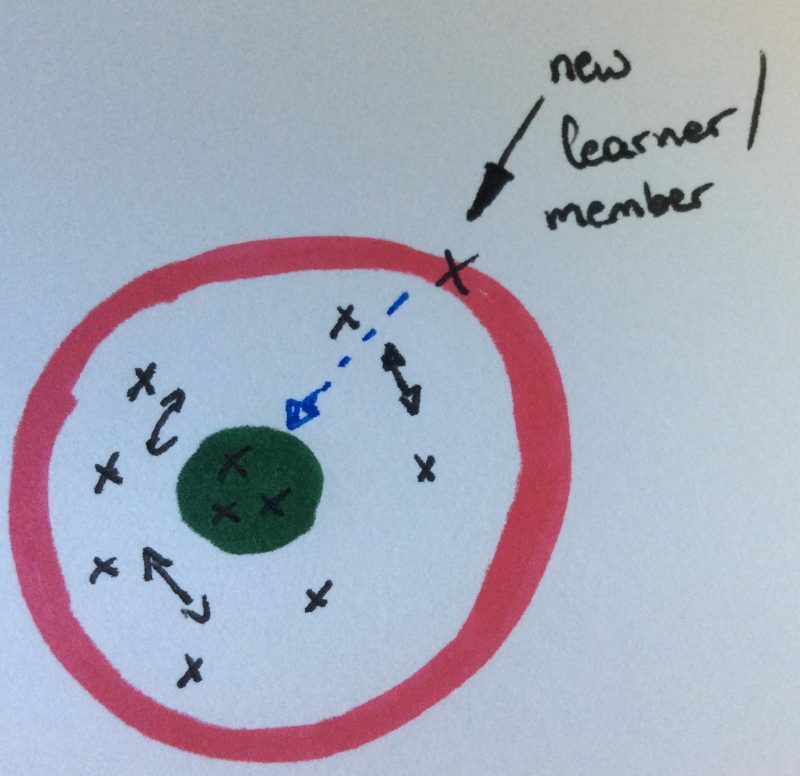 Situated learning is then the area where people engage with one another in order to gain new knowledge and understanding. By engaging with other members or learners within the community, we will gradually move from the fringes towards the core. Communities of practice are collectives of people with shared interests in achieving the same goal. Within education the teaching bodies of schools are communities of practice in that all teachers work towards achieving a vision for their students. All of us are part of such communities, but often do not become consciously aware of our engagement within them. For example, in staff rooms or corridors where teachers discuss specific teaching situations or strategies we embody and live the communities of practice. They can therefore happen everywhere. The obvious context is the workplace, but then in today’s globalised and connected world, communities of practice can also be experienced and lived online in support or discussion groups on social media platforms. The best examples for these are twitter chats, where educators discuss specific topic areas and share best practice. What makes and characterises good communities of practice? In their book Situated learning: Legitimate peripheral participation Lave and Wenger highlight many aspects in relation to communities of practice. They refer to the practical level, such as the differences between situated learning and traditional apprenticeships. But they also highlight the tensions between the social world of communities of practice and the world of individuals. To answer the question of what makes and characterises good communities of practice is not as simple as it may appear. For me, they are about sharing best practice, providing good quality feedback and consistent, efficient communication. Sharing best practice: In order to be able to improve our understanding we need to engage with our learning. By asking others we gain insights and views that we may not see ourselves. The use of reflective models such as Brookfield’s four lenses is a good starting point to improve our learning, but it is engaged collaboration with others that leads to deeper understanding. Providing good quality feedback: As we are worried that we could potentially upset our colleagues, we may provide feedback that is perhaps not of the best quality. Feedback should not be destructive in the sense that it upsets others. However, in order to improve our knowledge we do need to hear constructive suggestions. We may not always like what we hear, but our interpretation of events may be different from those that experience them. And this is where feedback is crucial. Consistent, efficient communication: In good communities of practice all members will regularly share their learning, their insights, their visions, their ambitions and to this end regular updates are required. Sharing practice and providing feedback also require effective communication. Indeed, every interaction we have with one another can be hugely influential. And so, communication is key. In his talk at the Educationfest 2016 John Amaechi also talks about communities of practice in the context of what he calls “proactive collegiality”. For Amaechi communities of practice can only function if those involved are genuinely interested in sharing best practice and providing relevant feedback, being critical friends for one another.